Diamond America has over 20 years of experience in custom extruder design for polymers and plastics, including expert 3D modeling and Finite Element Analysis (FEA) software systems to optimize die and extruder performance and quality. Plastics extrusion equipment is used for continuous, high-volume manufacture of a wide range of final products that have constant cross section, such as plastic pipes, frames, sheeting and films. The compression ratio is the ratio of the screw depth at the feed zone by the hopper, to its depth at the metering zone by the die. Compression ratio varies greatly according to the polymer that is being processed. For example, where rigid PVC requires a compression ratio of around 2.3:1, polypropylene or a more slippery material requires a ratio of nearer 4:1. The compression ratio is also impacted by the relationship of cross sectional areas at the screw feed and metering points. Finally, barrier designs, mixers, and variable lead screws affect not only the compression ratio, but the final screw output as well. The design of polymer extrusion equipment is indeed a very specialized process. 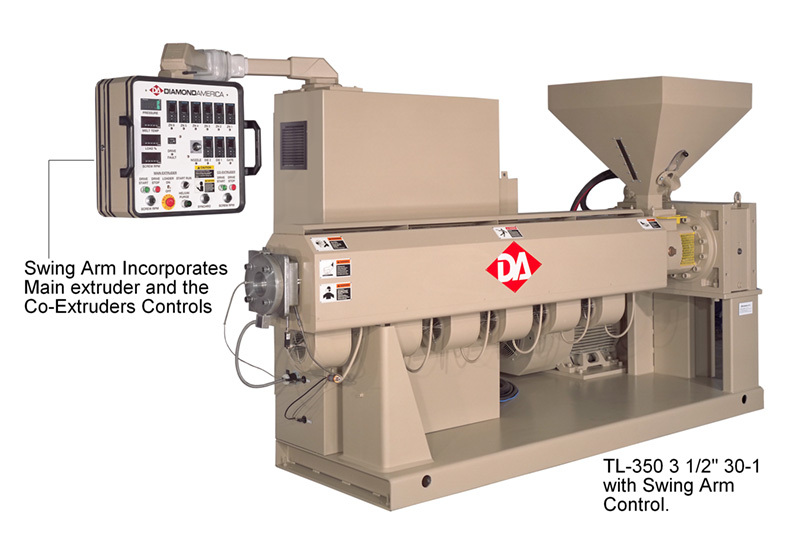 Dies have to be carefully designed to handle the specific behavior of plastic extrusion melts. Polymers consist of long chains of molecules which become aligned and oriented in a single direction when forced through a die. On release, they tend to diverge randomly when no longer constrained, causing a phenomenon known as ‘die swell’.